Linux Graphics Debugger is a 3D graphics development tool that allows developers to debug and profile OpenGL 4.x on Linux. It enables professional graphics developers to get the most out of their NVIDIA GeForce and Quadro GPUs on a variety of Linux distributions. This tool supports desktop class GPUs and inherits from the many man-years of investment in OpenGL development tools from the Tegra Graphics Debugger and NVIDIA® Nsight™ Visual Studio Edition. Please visit Linux Graphics Debugger 2.3 - New Features to see all that you can do with this new release! NVIDIA Linux Graphics Debugger 2.3 is offered free of charge, but requires NVIDIA Registered Developer Program membership. 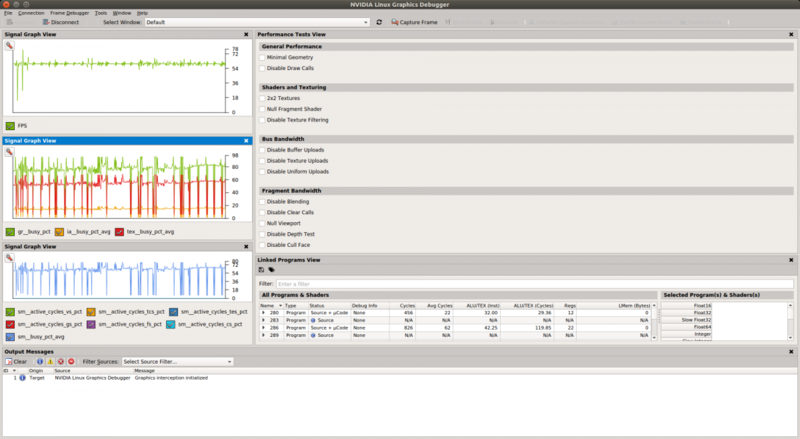 Use Linux Graphics Debugger to attach to your graphics application and monitor key software and hardware performance metrics. The Performance Dashboard will help you ensure that you're taking full advantage of the hardware by reporting the rendering performance across the GPU. 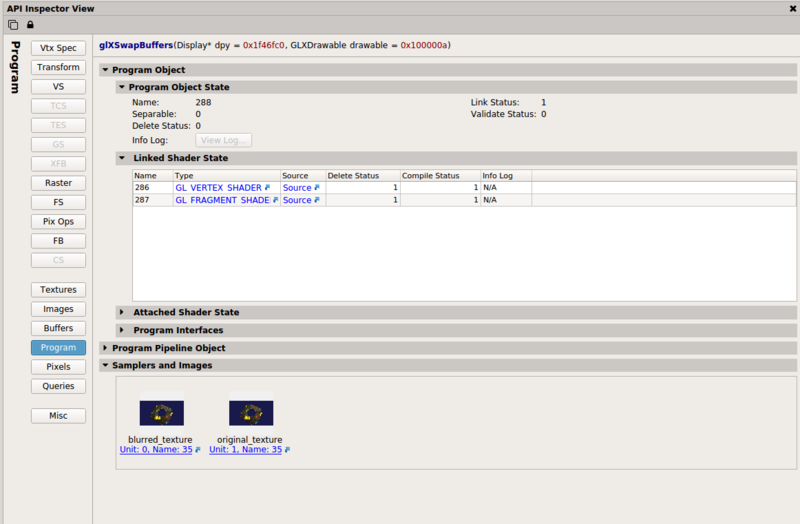 The Frame Debugger grabs a rendered frame from your application for further analysis and debugging. Powerful tools, such as the Frame Scrubber and the Event List allow you to navigate the massive amounts of data generated by your application. Other views, such as the Resources View, allow you to explore your application and examine assets, while the API Inspector provides a view into the internals of your application. The Frame Profiler uses hardware performance monitors to measure unit utilization and throughput, reporting the performance limiters for the rendered frame. The high level overview shows where shader cycles are spent and memory bandwidth utilization. Additional features provide more granular details. For example, you can group similar rendering commands based on common state, providing maximum bang for your buck on optimization effort. With Linux Graphics Debugger, you can edit and recompile shader source code on the fly, allowing you to experiment with modifications to your shader source for both performance and debugging. These modifications can easily be toggled or updated to compare rendering or performance results in conjunction with directed tests. Fedora 25 (x64 only); Fedora 26 is not supported for this release. 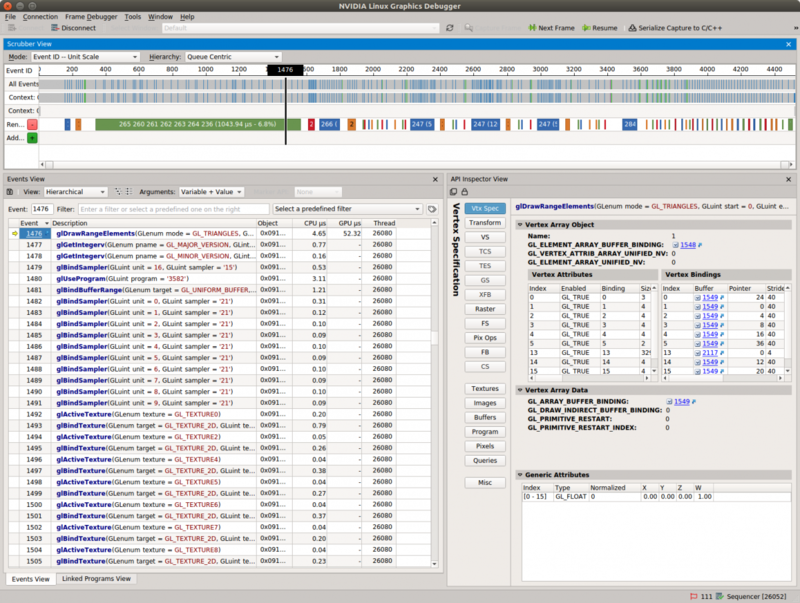 Versions of the Linux Graphics Debugger may be found in the release archive. Instructional Videos and Webinars can be found here. To provide feedback, request additional features or report support issues, please use the Developer Forums.